Spatchcocking is a phenomenal way to cook a bird. It maximizes the crispy skin and minimizes the time to get the bird on the table. There are a few tradeoffs. One, you miss that glorious “ta-da” moment of a beautiful roast bird. Two, my husband giggles like Beavis every time I say “spatchcocked”. For those of you who are unfamiliar with spatchcocking, it’s kind of like the chicken (or turkey) is on the losing end of a Mortal Kombat against Sub-Zero. You remove the wishbone and the spine (holding it above your head while screaming “FATALITY! SUB-ZERO WINS!” is optional but recommended). This process is done easier with a chefs knife than kitchen shears, especially if you go through the thigh joints. Then you crack the breastbone to make the bird flat. Finally you threaten your spouse with an anchovy fillet if he doesn’t stop making sad deflate-y sounds. Save the spine, neck, and wingtips to make soup later. Flatter than a Patriot’s football. It’s pretty much impossible to take a picture of a spatchcocked chicken that doesn’t make it look ridiculous. Even if there are decorative lemons in the background. Now since the big advantage of the flat bird is the beautiful skin. So to maximize delicious, crispy browning you need to maximize contact with the skillet. I’m sure that you could get a fancy-dancy stainless steel widget at Williams and Sonoma for like, seventy bucks. But you’ve probably already got something lying around the kitchen that can flatten the bird further. I opted for my Dutch oven. 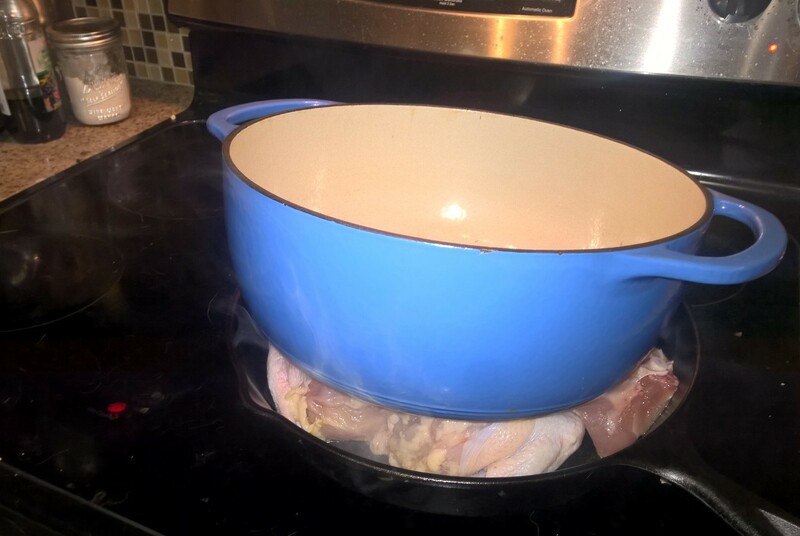 A chicken under every pot! Leave the chicken there until for a good while until it turns a beautiful shade of golden brown. About five minutes. Then flip the bird. The chicken. Flip the chicken. 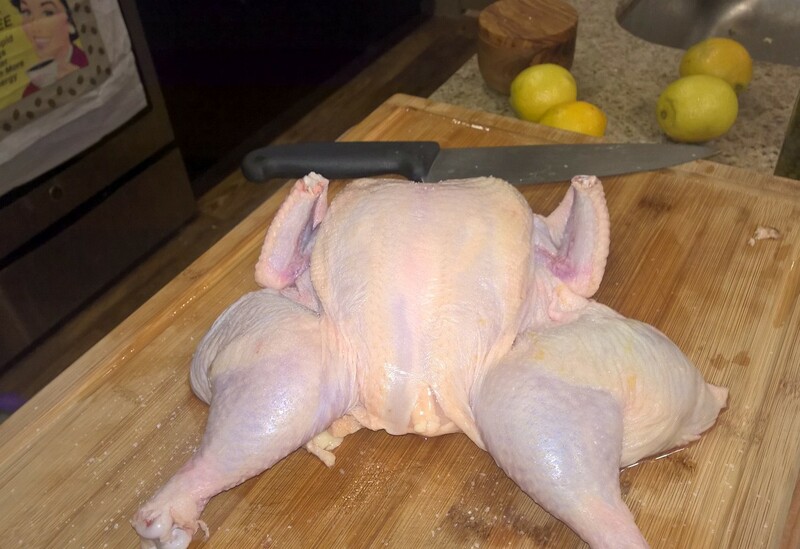 Be careful while doing so because the thighs are only connected to the rest of the chicken by skin and a very thin layer of muscle at this point. I almost made the dog really happy when one of the leg quarters nearly dropped onto the floor. This recipe comes from Food & Wine: Easy Weeknight Dinners. It was a special edition put out last October that has the right balance of “not stressful” and “actually cooking” that I crave. This particular recipe was contributed by Chris Cosentino, and may be the least intimidating thing I’ve ever associated with his cookery. Skillet large. Cast Iron is perfect. Do not use a non-stick pan. Something Heavy and heat proof. Cast Iron is also perfect here. Foil wrapped bricks are also good. Good sharp chef’s knife or poultry shears. Katana, fire axe, or claymore would be fun too. Turn the chicken back side up. Starting at the neck, cut alongside the spine on either side. You’ll cut through the ribs easily. The easiest way to get through the hips is to sever the thighs from the pelvis at the joint. 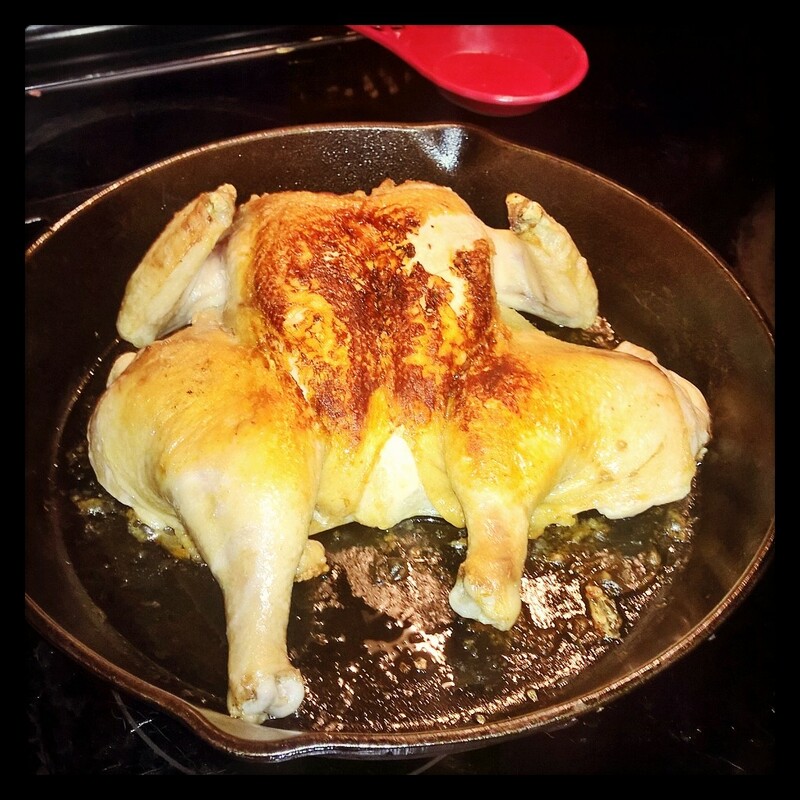 Turn the chicken right side up again and push down on the breast until you crack the breastbone and it lies flatish. Pat the bird dry and generously sprinkle with salt and pepper on both sides. Heat a bit of olive oil in the skillet over medium-high heat. Place the bird in the skillet, skin side down. Put your heavy thing on the chicken. Reduce the heat to medium and let cook until the skin is golden, brown, and delicious (GB&D). About 5 minutes. Flip the chicken and put it in the oven. A 4 lb bird should take roughly 20 minutes. Check the temperature at the inner thigh with a probe thermometer. The magic number is 160 degrees. Take the chicken out of the oven and move it to a platter. Let it rest for 10 minutes. Pour the lemon juice and chicken stock together and set it near the stove. Put the skillet back on the stove on high heat. Add the parsley, garlic, lemon zest, and capers. Cook very briefly. Once it starts sizzling and smelling good, about 30 seconds, it’s done. Add the chicken stock and lemon juice mixture before the garlic burns. Scrape up any browned bits from the bottom of the pan. (This is why I told you not to use non-stick). Cook the sauce until it is reduced by half. Stir in the anchovies. Remove from heat. Carve up the chicken, plate, top with sauce, and serve. A little fresh lemon on the side is nice. Serving suggestion: we served this alongside some green beans. 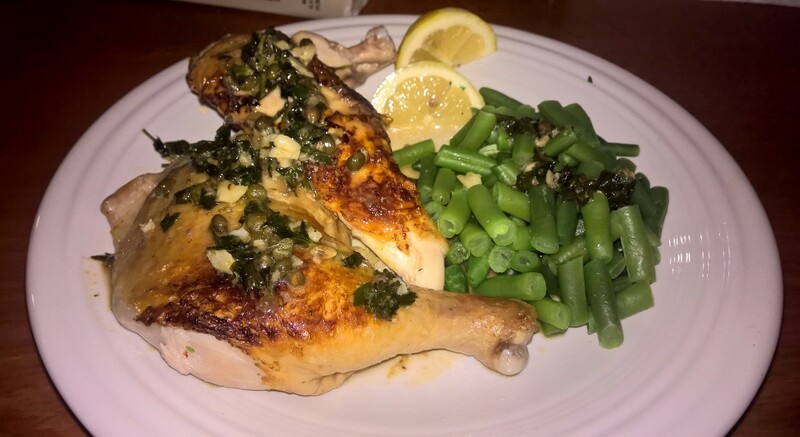 The green beans didn’t really stand up to the intense flavors in the sauce. Asparagus would be a better choice. ProTip: For any meat cooked in a skillet there is an easy way to tell when it is easy to flip. As the proteins cook, they become less sticky. If the meat is sticking to the pan, it is not ready to be flipped yet and is not sufficiently Golden, Brown and Delicious (GB&D). If the meat can be lifted with just a tiny bit of effort from the spatula, then it is ready to be flipped.